Mum and dad were frugal folk. Growing up, they evidentially prized experiences, travel and further education over buying us things. How sensible. And, really, how wise. Yet admittedly as a self conscious kid, how frustrating. As a child, I remember pining noisily for a mountain bike and a My Little Pony playset. I never got them. Instead I received, inwardly glumly, a Rainbow Dash pony and a second hand racer bike from the lady selling it down the lane. Separate years, of course. Nope, we weren’t spoilt sisters when it came to materialism. I often thank God that I had to sport a school uniform, unlike my American children who wear their own clothes. What would I have worn? Big sister’s questionable hand-me-downs?! Even Tag Day, where we got to wear our own clothes for a school day, was a source of quiet dread. My parents gave other qualities to their girls; ambition, life experience, freedom, responsibility and a peek into many differing cultures. These, quite frankly, are priceless. And I’m certain I wouldn’t be writing to you from America had they not brought me up the way they did. Being married to an American is very interesting. It still fascinates me after ten years. Eric had lots of things when we met, most of which he didn’t seem that possessive about. (Well, aside from his gaming computer.) I remember being surprised a decade ago with my first glimpse into a variety of American home lives. Even many low-income earners had a laptops and walk-in wardrobes. Technology seemed to be more of a priority here, whereas fashion and makeup back home appeared to take precedence. The common theme though is Having. That’s our world now though, isn’t it? Buy now, pay later. We’ve also hosted BBQ’s where people have left big coolers and lawn chairs behind and have never reclaimed them. I like how some people in the US don’t seem overly and unhealthily attached to things, and are generous with what they have. But it may be a bit of a case of, there is so much cheaply and abundantly available that its just too easy to go buy another. Disposable culture, you might say. Perhaps as such, friends I spent my time with didn’t think too much about what to wear or how to decorate their house. I remember feeling frivolous even wearing makeup. Civilian suburbia in America is different. Its a bit more like the America you see portrayed on the telly. People very often have beautiful white teeth, and manicured front yards and decorate for every season. They hire dog psychologists and regularly have pedicures and hairstyles that make you want to book an appointment at the salon. And this is Florida, supposedly we’re more casual here. But we have access to a plethora of malls and stores and shops dedicated to anything you can think of; chocolate, hippy boutiques, crafts and coffee. Its all right here, within a radius of a few miles. Being an English country girl, where we didn’t have as much as a local shop in our hamlet, this is quite a contrast. Its hard not to get scooped up into materialism. We tend to be products of our own environments. I too have succumbed to my first ever designer handbag (I’m in love with Michael Kors), grow wide-eyed at the local mall and have even resorted to buying my yoga clothes not from disposable fashion shops but actual yoga clothes stores. I often visit my parents’ house back in Dorset and am pleasantly struck by the simple pleasures of my childhood. My children play, just as we did, by using their imagination. 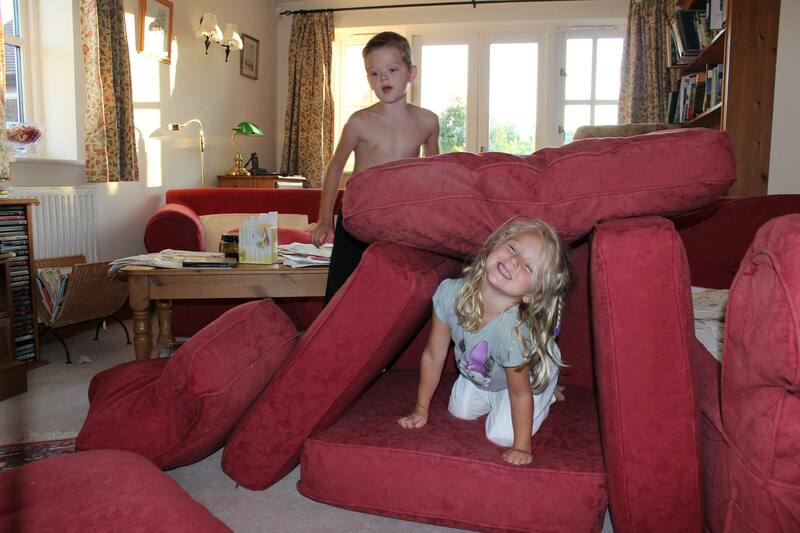 They make forts out of the sofas, amble muddily through bluebell woods and go blackberry picking in the hedgerows. All of its free. In my experiences as a nomad and expat I’ve come to this conclusion; Having is fine, wonderful in fact. I bask in gratitude every time I pull into my driveway and enjoy the hard laboring landscaping efforts my husband and his sweat have produced. I love shopping, take enormous joy from buying toys and clothes for my children and adding a top coat to a cheery nail polish color. Once I loose that sense of gratitude, then I’ll worry. Once I start thinking about the next thing to get, with little regard to the last thing bought, as though I’m trying to fill a void, then I hope to be conscious enough to observe this perpetual wanting. Perhaps I’m seeking joy in the external world, even though I really know true joy is an inside job. As long as I never neglect my internal world and continue to work on me as a soul, I think I’ll be able to happily enjoy the abundance our generation has created. That’s the key for me; having but always with a grounded quality, a gratitude and humility. I do believe when we come from this space we give from our overflow to those who might need it. Perhaps that’s why many entrepreneurs become philanthropists, and many home- makers become involved in voluntary or charitable works. The Florida I’m exposed to may be notably materialistic, contextually to my past, but self discovery is a big deal over here too. There’s a bit of a joke that to get your US Green Card you had to have a Shrink first. No, but…there is a celebration of the spiritual over here. Its quite common-place to meditate, see a psychic, (if your belief system supports this), go off to a wellness workshop, read self help books and plan retreats. There’s also a enthusiasm-no, passion-for belief systems or religions. Places of worship are packed, as suppose to dwindling numbers back home in churches, at least. I respect this balance between the material world and the spiritual that America seems to have. Life is almost amped up over here, negating the reservedness and social or traditional confines of Britain, which I at least found restricted my personal expression and freedom. Some people I’ve met, without blushing, share how much they earn here, or how much they bought their house for. No such thing would be discussed where I came from; money was a seeming vulgar necessity. Even I never knew how much dad earned, let alone Mr. Jones next door. What are your thoughts? How has your upbringing translated into how you appreciate things as an adult, or how you parent? Does your sense of gratitude increase or decrease with today’s plentiful culture? This entry was posted in Domesticity, Expat Stuff, Parenting, Spirituality.